Microarray approaches are widely used high-throughput techniques to assess simultaneously the expression of thousands of genes under certain conditions and study the effects of certain treatments, diseases, and developmental stages. The traditional way to perform such experiments is to design oligonucleotide hybridization probes that correspond to specific genes and then measure the expression of the genes in order to determine which of them are up- or down-regulated compared to a condition that is used as a control. Hitherto, individual experiments cannot capture the bigger picture of how a biological system works and, therefore, data integration from multiple experimental studies and external data repositories is necessary to understand the function of genes and their expression patterns under certain conditions. Therefore, the development of methods for handling, integrating, comparing, interpreting and visualizing microarray data is necessary. The selection of an appropriate method for analyzing microarray datasets is not an easy task. Here, we provide an overview of the various methods developed for microarray data analysis, as well as suggestions for choosing the appropriate method for microarray meta-analysis. Parametric tests, so called t-tests, compare groups, usually two, at the same time. The t-test assesses whether the means of two groups have statistically significant differences. This analysis is used to compare the means of two groups, and especially to analyse the two-group posttest-only randomized experimental design. A drawback of the t-test in microarray data analysis is that most microarray experiments contain only a few samples in each group and the assumption of normality does not hold. Thus, several alternatives to the t-test have been proposed in the literature. Bootstrap and permutation methods are popular resampling methods readily available in major statistical packages like Stata and R. There are various implementations of the Bootstrap available in Stata (bootstrap command) and in R (boot command). Permutation can be also performed using the permute and permtest (for paired observations) commands in Stata, as well as the perm command in R. Below we give examples of performing bootstrapping and permutation t-test is Stata. The Bayes Factor method of Rouder and coworkers, which is known as the Jeffreys–Zellner–Siow (JZS) t-test, is available as a web-calculator (http://pcl.missouri.edu/bayesfactor), as well as an R package (https://cran.r-project.org/web/packages/BayesFactor/index.html). The Savage–Dickey (SD) t-test, proposed by Wetzels and coworkers is inspired by the JZS t-test and retains its key concepts. It is, however, applicable to a wider range of statistical problems, since it allows researchers to test order restrictions and applies to two-sample situations with unequal variance. The SD t-test is also implemented into an R package that uses WinBUGS (http://www.ruudwetzels.com/sdtest). Baldi and Long were among the first to discuss Bayesian methods for the t-test in the context of microarray experiments and they preferred to develop an empirical Bayesian regularized t-test method. This method is implemented in the web-server Cyber-T (http://cybert.ics.uci.edu/) and in R (http://cybert.ics.uci.edu/). The limma method is one of the most widely used methods for analysing DEGs, and it is available as a Bioconductor package in R (http://bioinf.wehi.edu.au/limma). SAM is one of the oldest and most widely-used methods and it is available as an Excel plugin at http://statweb.stanford.edu/~tibs/SAM/, as well as implemented in several R packages (samr, ema). The first statistical method is a standard approach for meta-analysis using fixed or random effects. In principle, any suitable effect size can be used in meta-analysis; in practice, however, most authors advocate the standardized mean difference. In order to handle the problem of small sample size and non-normal data, most authors suggest a type of correction for calculating the statistical significance. Therefore, instead of relying on the normal approximation included in the standard methods, they propose the permutation test.Although Choi and coworkers suggest permutations to calculate p-values, a faster solution is offered in their Bioconductor package GeneMeta, which assumes a normal distribution on the z-scores after checking the reliability of this hypothesis by a Q–Q plot. In general, all the aforementioned resampling methods can be used, with bootstrapping being, probably, the most advantageous since it requires a smaller number of replications. The bootstrap or the permutation methods can also be used in different settings. One option would be to perform an analysis for each study separately, obtain a corrected estimate of variance and then use this, with standard software, in order to calculate the weights for the meta-analysis. Another option would be to perform the analysis in a single step using the resampling strategy (bootstrap or permutation) in a stratified manner, in which the strata are the studies. Examples in Stata are given below. The aforementioned methods, since they are standard methods for meta-analysis, can be easily extended to a Bayesian framework. The WinBUGS code to fit the models of Conlon and coworkers is available at http://people.math.umass.edu/~conlon/research/BayesPoolMicro/. Finally, another promising approach is to use the moderated effect sizes calculated by methods such as limma, instead of the typical effect sizes, in the traditional meta-analysis. This is a two-step method relying in the first step on an advanced method for regularized t-test. Then, provided that that t=d√n, a traditional random effects meta-analysis is performed.This approach is implemented in the R package metaMA. The most complete package among them is MetaDE, which also offers functionality for preprocessing the data, as well as for displaying the results graphically. A related method, termed METRADISC (Meta-analysis of Rank Discovery Dataset), is based on the same principle, but it is more general. The ranking within each study is performed with any available method (FC, t-test, p-value etc.) and then the average rank of a particular gene across studies is calculated. The overall mean can be weighted or unweighted; the weighted overall mean resembles the traditional methods for meta-analysis. The between-study heterogeneity of the study-specific ranks can also be computed. 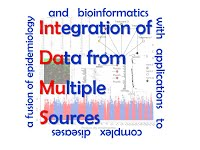 METRADISC is implemented in R (http://www.inside-r.org/node/155959) and it is also available as a stand-alone application (http://biomath.med.uth.gr/). A more sophisticated method was presented by Zaykin and coworkers, the so-called truncated product method (TPM). Their procedure was to use the product of only those p-values less than a specific cut-off value to evaluate the probability of such a product, or a smaller value, under the overall hypothesis that all k hypotheses are true. Source code for implementing TPM can be obtained from http://statgen.ncsu.edu/zaykin/tpm/. Nevertheless, combining p-values presents serious problems relative to combining effect sizes, as in the case of testing different null hypotheses. Moreover, in the combination of p-value, the direction of the association is not taken into consideration and therefore all p-values have to be one-sided, otherwise up- and down-regulated genes have to be combined separately. Finally, these methods cannot quantify the magnitude of the association (the effect size), and, most importantly, do not allow between-study heterogeneity. A method developed by Stouffer partially overcomes these limitations, by combining the equivalent Z-scores instead of p-value. di in ye " Calculation of Achieved Significance Level (ASL) using the bootstrap"
di in ye " The idea is to recenter the two samples to the combined sample mean"
di in ye " so that the data now conform to the null hypothesis but that the"
di in ye " variances within the samples remain unchanged"
Program for performing permutation analysis with t-test. This is straightforward because permutation calculates directly the p-value. Program for performing meta-analysis using the standardized difference (d). The metan command cannot be used, because it requires the data collapsed (i.e. it uses only the mean and the standard deviation), and in order to use bootstrap or permutation (see the next program) we need the full dataset. qui keep if `x' !=. Program for performing 1-step bootstrap meta-analysis using d (calls the above-mentioned program "myDL3.ado"). Note that the case-control status (type) and the study variable are treated as strata in the bootstrap. di in ye "Performing meta-analysis for `var' gene"
In case one wants to used permutation instead, the program is very similar. Note that in this case only the study variable is used as strata, because the case-control variable is used for permuting the labels. file write meta " "